Nuts and seeds are calorie-rich and easy to snack on. 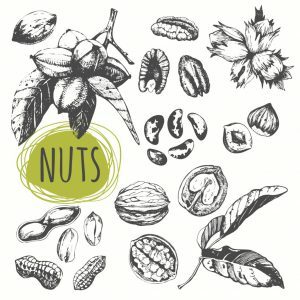 The most popular nuts eaten in the U.S. are walnuts, pecans, filberts, hazelnuts, cashews, Brazil nuts, pistachios, almonds, pine nuts, chestnuts and macadamia nuts. Popular seeds include pumpkin, sesame, flax and sunflower seeds. Nuts and seeds contain many nutrients, including fat, protein, carbohydrates, Vitamin E, magnesium, copper, selenium, B vitamins, iron, calcium, potassium, phosphorus and fiber. No single kind of nut or seed provides all these nutrients, so eating a variety is smart. Nuts containing less than 4 grams of saturated fat per serving may reduce the risk for heart disease. Mono-unsaturated and poly-unsaturated fats in nuts may help lower total and LDL cholesterol. Eating nuts several times a week may help lower blood pressure. People who eat nuts more often have more flexible arteries, reducing the risk of blood clots. However, nuts and seeds are rich in fat. Just 1.5 ounces (about 1/3 cup) can contain nearly 400 calories. Keep portions to a tight fistful that you eat a few times a week. Sprinkle dry roasted nuts or seeds into batters for quick breads like banana bread or bran muffins. Top cooked or dry cereal with nuts or seeds, or mix in ground flaxseed. Sprinkle nuts and seeds on salads and casseroles. Put a tablespoon of almond butter on apple or pear slices. Grind some nuts and seeds to add to the flour or cornmeal coating for oven-fried poultry or pork. Toss nuts or seeds with cooked vegetables like green beans, cabbage, Brussels sprouts or carrots. Top regular yogurt, frozen yogurt or sugar-free pudding with nuts. Mix nuts or seeds with dry whole grain cereal and raisins, dried cranberries or dried blueberries to make a trail mix. Some people are allergic to nuts and can even have a severe reaction from kissing or touching someone who ate or touched nuts. Mild symptoms include itchy and watery eyes, skin rash, sneezing, runny nose, shortness of breath, tingling of lips and tongue, nausea or vomiting, stomach pain or diarrhea. Some people are so allergic to nuts that they may experience swelling of the lips, tongue and face. They may feel dizzy and unsteady on their feet. These symptoms may lead to a life-threatening condition called anaphylaxis. If someone experiences these severe symptoms, call 911 immediately. Posted in Featured. This entry was tagged diet, healthy, holiday health, nutrition, nuts, pecans, recipe. Bookmark the permalink.